Unclaimed Cash on 'GMA': W. Va. Woman Finds Nearly $15K Left By Her Mom! There are 117 million unclaimed money listings across the country waiting to be reunited with their rightful owners. That's enough for roughly every third person in the United States. "GMA" caught up with one of those lucky people on the day she received her check. We tagged along with the West Virginia Treasurer's Office as they performed their version of a Prize Patrol visit. West Virginia Treasurer John Perdue made Vickie Shaluta's day when he rang her doorbell. You Asked, We Answered: Expert Answers Your Unclaimed Money Questions Here! Click here for tips and tricks on finding unclaimed money left by a loved one. "Vickie?" he said when the Shaluta, of St. Albans, answered the door. Perdue is holding a big check in his hand. How big is the check? You'll find out, but first, some background. Vickie's mom, Lenora Adkins, died of Alzheimer's disease in July of last year. She left behind dozens of handmade quilts, warmed by her love and her secret recipe for making the most amazing fudge. Other than that, Lenora was penniless. Or so Vickie thought. "So when I got a call from the bank claiming that money had gone to unclaimed property, I was shocked because I didn't know anything else existed," Shaluta told "Good Morning America." Adkins' mind had been lost to Alzheimer's and her money could easily have followed. Her bank had been bought out. Twice. All the account numbers had changed. But a sharp-eyed BB&T banker named Cammie McCormick spotted a CD in Adkins' name. And it had been sitting there, growing. "Then Cammie turned into really a sleuth! She needed to do research," Phyllis Arnold of BB&T said. West Virginia requires banks to send unclaimed accounts to the treasurer's office after five to seven years for safekeeping. West Virginia processes more than 20,000 cases a year. And still, there is $161 million here waiting to be found. Shaluta's paperwork landed on Joann Tinsley's desk. "We make sure that everything matches before we hand it over to someone," said Tinsley, the claims manager for the West Virginia Treasurer's Office. "Even if it's $50, do you want to give it to the wrong person?" And Adkins' CD was a lot more than $50. 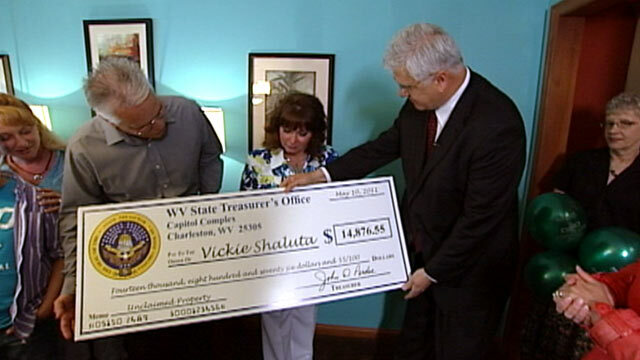 At last, the state of West Virginia cut Shaluta a check. It was one of the largest unclaimed property cases of the year. "It's about helping West Virginians return their money. Their money! It's not the state's money," Perdue said. West Virginia is one of the most efficient, aggressive states about reuniting people with their unclaimed money. And every now and then Treasurer John Perdue likes to do it in person. "Thank you! Thank you!" Shaluta said. "Vickie, what do you plan to do with that money," Perdue asked? "I think they are thinking family vacation," she replied. "It's like a gift from mom. That's exactly how I feel about it. It's a gift," she added. Even if you don't think you have left any of your own money lying around, it's a good idea to search to see if deceased family members have left money for you. So how often does this happen -- that people pass on and their families don't know about all of their accounts? It's one of the most common ways that property gets abandoned. If you think about it, have you left a list of all of your accounts that your heirs can find if you die? Click here for 11 more tips from "GMA" to find unclaimed cash.